Edmontonians enduring bone-chilling temperatures shouldn't expect a reprieve from the extreme cold any time soon. There's hope on the horizon for Edmontonians who've been enduring bone-chilling temperatures. A reprieve from the cold is expected to come just four, teeth-chattering days from now. Environment Canada expects temperatures to remain cold through the weekend, then rise to –15 C on Monday. By Wednesday, the mercury is expected to rise to a downright balmy –6 C.
In the meantime, Alberta remains terribly cold. As of Thursday morning, almost every region in the province remained under extreme cold warnings. In Edmonton, temperatures hovered around –24 C with a windchill that made it feel closer to –40. Environment Canada said regions in central and southern parts of the province will see slight moderation in temperatures Thursday, as a weather system brings in cloud and snow. But don't get too excited. The extreme cold is expected to return to most areas Friday night. 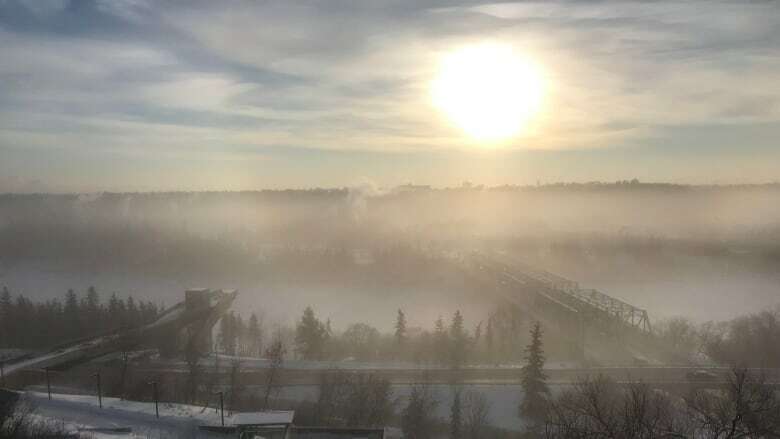 Edmonton has been in the grips of a cold snap for nearly a week, with daytime temperatures hovering around –30 C since Saturday. On Tuesday the mercury dripped down to –32.8 C at Edmonton's Blatchford weather station, making it the coldest day the city had seen in more than nine years.